While the mud room isn’t a standard addition to Australian house plans, it is growing in popularity. The United States has been building houses with mud rooms for decades. Their homeowners appreciate the convenience and organisation a mud room provides the family. The room allows homeowners to enter the house to take off wet, muddy boots and heavy coats and scarves that aren’t needed in the warm home. While Australians don’t have as much snow or overcoats as Americans, a mud room still makes sense. Think of a mud room as a giant drop zone. Instead of a small hall table for your keys and wallets, the mud room can be the catch-all for everything from kids sporting equipment to the work bag. Rather than coming home and dropping this gear all over the living room floor, the items stay in the mud room in easy reach for when you leave the house again and need to take them with you. A mud room needs to be one of the most functional spaces in the house, so make use of all available space. Often hidden away from visitors to the home and off the garage, it doesn’t need to be the most stylish. But as the homeowner it may be your main entrance to the home, so make it comfortable. The walls can have hooks attached for keeping school bags off the ground and for hanging the coat, umbrella and scarf on a wet wintry day. A mud room is an ideal place for members of the household to remove their shoes before they enter the main living areas. Make it comfortable to put on shoes in the morning with some seating. Every homeowner has their own reason for including a mud room in the plans of their new home but here are 5 common uses for a mud room. There is nothing more frustrating than waiting for your child to find their missing shoe when you should be on the way to school in the morning. Give each member of the family a hook for hanging their hat and a basket for holding small items they need to grab on their way out the door and your start to the day will be more organised and less stressful. Some busy families rely on a ‘command centre’ to help keep it organised and arriving on time to where they need to go. If you enter and exit the home through your mud room, it makes sense to incorporate your command centre here. Incoming and outgoing mail can be sorted, the calendar checked, notes placed in school bags and library book returns stored here. If your laundry is off the garage, it’s probably already a dumping ground. Make it work better by combining the mud room and laundry as one organised room. You can incorporate built-in storage in your laundry and make it the most functional room in your home. This built-in storage has drawers big enough to hold the shoe collection you regularly wear so there is no need for shoes to come into the main living area of their home. 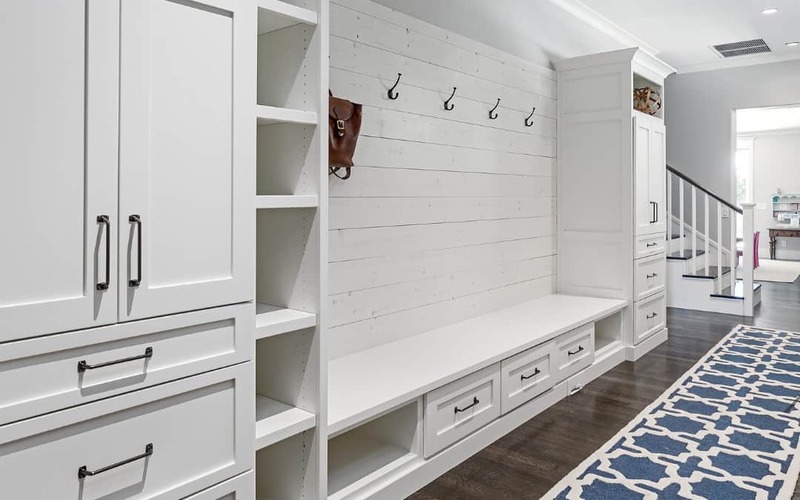 Custom shelving and storage will ensure you make the best use of every square space of your mud room, so you fit in all the family’s shoes, bags and coats. It’s no wonder the mud room is also known as the boot room. Just because a mud room needs to be one of the most functional rooms in your house, there is no reason why it can’t be comfy. Style your mud room as you would your living room with co-ordinating cushions and prints so you can enjoy the space every day. If you like the idea of including a mud room in a luxury home design, discuss your options by calling Alex from JAV Developments on (08) 9381 4174 or contact us.